Townhouse 1 occupies basement and ground floors, containing 2 Queen bedrooms and a twin single bedroom, with separate study/reading room. Living room is light and open, overlooking St David's Park across Davey St. Thick brick walls give the residence a pleasantly surprising serene privacy. Full laundry is contained behind a cupboard in the stunning spacious bathroom, complete with double head shower and claw bath to start the holiday mood properly. This is a rare holiday rental opportunity due to its central location, character of the building, and high quality fixtures, fittings and furnishings. Townhouse 2 occupies first and second floors, containing 2 Queen bedrooms and a twin single bedroom, with a large entry foyer and separate study/reading area. Living room is light and open, overlooking St David's Park from an elevated position. Thick brick walls give the residence a pleasantly surprising serene privacy. Laundry is nestled under the stairs with a powder room, while bathroom containing oversize shower is on the second floor. Each bedroom is individually decorated, retaining heritage character and some distinctive design touches. This is a rare holiday rental opportunity due to its central location, character of the building, and high quality fixtures, fittings and furnishings. 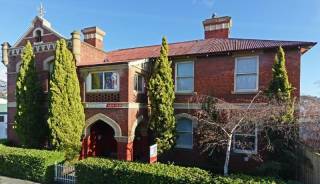 This original Georgian home has been beautifully renovated into two 3-Bedroom Townhouses, providing for the modern visitor whilst maintaining the historical integrity of the building, originally constructed in 1856. This is a beautiful property with unique character, from it's Georgian red brick facade and internal period features still intact, offset by designer interior fixtures and fittings. 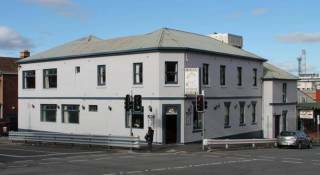 55 Davey is in the heart of the Salamanca district, 200 metres to the famous Salamanca Market and waterfront precinct, while a 2 minute walk will find you in Hobart's Central Business District. Enjoy a picnic in your very own front yard, St David's Park (55 Davey is equipped with a picnic basket and rug), or enjoy fish and chips on Constitution Dock, finish of the famous Sydney to Hobart Yacht race. Offstreet car parking is available for $15 per night if required, with unlimited entry and exit and an allocated bay. Please enquire if you require carparking during your stay. ATAP approved provider - The Australian Tourism Accreditation Program accreditation provides you with an assurance that we are committed to professionalism in business operations and delivery of service. Townhouse #1 occupies the old servant's quarters and ground floor while Townhouse #2 occupies the first and second storeys. Living rooms offer stunning views over St David's Park. Light filled lounge features leather lounge suites, flat screen TV and DVD player. Industrial style kitchen with stainless steel benchtops, modern appliances, full fridge, dishwasher, oven and cooks top. Coffee pod machine, and other tea and coffee facilities provided too. Breathtaking bathroom in Townhouse 1! A huge expanse invites one to relax in the deep claw and ball bath, or indulge in the double shower. Twin basins and a polished concrete floor finish off this surprise package. A hidden cupboard houses the washing machine, dryer and trough as well as plenty of storage options for luggage. In the heart of the culture, spirit and history that is Hobart. 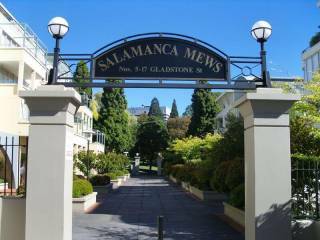 Salamanca Place and it's famous Market 1 minute walk away. St David's Park is across the road with it's glorious gardens and significant colonial history. Gourmet eateries are just around any corner, as is the Hobart waterfront where the Antarctic research ships, fishing fleet and kayakers all mingle together. 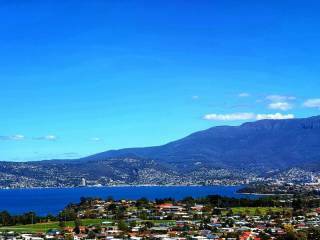 Catch the MONA ferry from Brooke St Wharf, view the world at your feet from Mt Wellington, visit Richmond, Port Arthur, Salmon farms, Cherry orchards, Cadbury, Wineries and Restaurants, Highland Lakes and wilderness treasures of Tasmania. Payments are accepted by direct debit into the FIFTY FIVE DAVEY bank account. Reference Your Surname and Month of Your Arrival), or by credit card (Visa or Mastercard). Direct debit will not incur any transaction fee, but credit card payments incur a 2.3% transaction fee. A non-refundable deposit of the first night's accommodation confirms your booking. This deposit will not be refunded if the booking is cancelled. Remainder of full tariff is to be paid at least 1 month prior to your arrival date. Failure to remit the full tariff by this time may result in cancellation of your booking, unless alternative payment arrangements have been made by agreement with management - please contact to discuss. Bookings made within 1 month of arrival date must be paid for in full at the time of booking. A credit card authority for security deposit is required at the time of booking for up to $500 to cover costs of damage or breakages occurring during your stay. No deductions will be made unless we need to make a claim against your security deposit. If required, this will be done within 7 working days after your departure. For international money transfer, values are in $AU. Guests should contact us for instructions on this type of transaction. Payment of deposit or full tariff constitutes guest's acceptance of these terms & conditions. Bookings are to be a minimum of 2 nights unless by arrangement. Up to 4 guests are included. Extra adult and child (16 and under) fees, carparking and late checkout fees appear near published nightly rates. Description of the property is given in good faith and no responsibility for misinterpretation will be accepted. Refunds will not be given if you are not satisfied with the accommodation. Bed Linen and towels are supplied, in addition to full kitchen facilities. Cots and high chairs are available by prior arrangement, but cot linen is not provided. Permitted use of the property is for quiet enjoyment, parties & functions are strictly prohibited. The property is not equipped for large groups or functions. Disturbance to our neighbors (including excessive noise) is prohibited and may result in termination of rental and loss of bond. No smoking inside, no pets allowed. Any breach of the above conditions permits the owner to refuse the key, or immediately terminate the occupancy with forfeiture of your tariff. The owners take no responsibility for tenant’s personal property during their stay. Damage, breakages, theft and loss are tenants responsibility. Cancellations made more than 14 days prior to arrival date will be refunded, less the non-refundable deposit of the first night's tariff. Cancellations made inside 14 days prior to the arrival date are non-refundable. Cancellations on bookings made during Christmas, Easter, or public holidays will be resolved by management discretion. In the event that we are able to successfully re-let the property for the cancelled period at the same rate, the full tariff (less first night's deposit) will be refunded.